It’s wonderful! 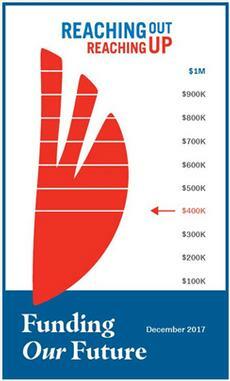 Temple Shalom launched its capital campaign on November 5th, and results have been outstanding. We raised $400,000 in the first month! Long-time members, new members, and non-members have come forward with great generosity: a $100,000 donation from the Chochinov/Graham family; $25,000 donations from the Gabors, from the Wolfsons, and from Linda Freed; numerous donations at the $10,000 level; and many many more from the entire board and staff, from congregation members, and from community leaders who belong to other synagogues but believe we fulfill an important role in the community. The Asper Foundation and The Jewish Foundation of Manitoba have made significant contributions. There was a great turnout for the launch, where people enjoyed the thoughtful words from Rabbi Tepper, from Campaign Co-Chairs Miral and Robbie Gabor, and from Linda Freed, Temple President. We heard superb music from Len Udow and Janet Pelletier-Goetze, and a lovely reception sponsored by Party Stuff and Joy Coffee Bar. The Reaching Out Reaching Up campaign is a road-map to our future as the only Reform Jewish synagogue in Winnipeg. The response to the campaign shows that we are recognized as a leader in the Jewish community. We are planning for our future and one major step is to ensure the building’s infrastructure meets our future needs. Stay tuned for the rest of our plans! For information about the campaign or to make a contribution please call 204-795-4770 or email [email protected] and we’ll call you!